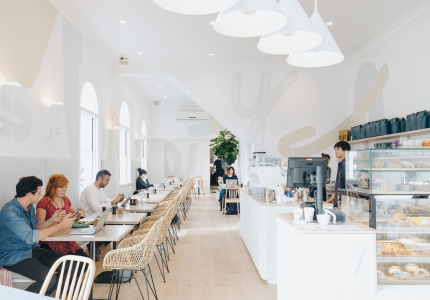 Christina Higgins and Steve Svensen brought us their perennially packed Armadale cafe Moby at the end of 2016. 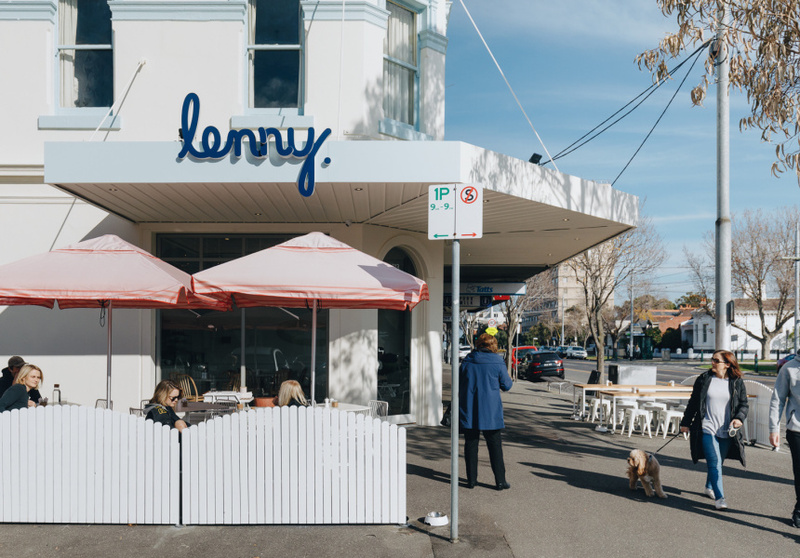 Now the pair has backed it up with another cafe, Lenny, in Albert Park. One of those aspects being their choice of Windsor-based design firm Golden to oversee the fit-out. The studio was responsible for Moby’s award-winning interior. Brightly lit with inviting wicker chairs, a pink marble benchtop, and a palette of white and blue, that’s how it feels. 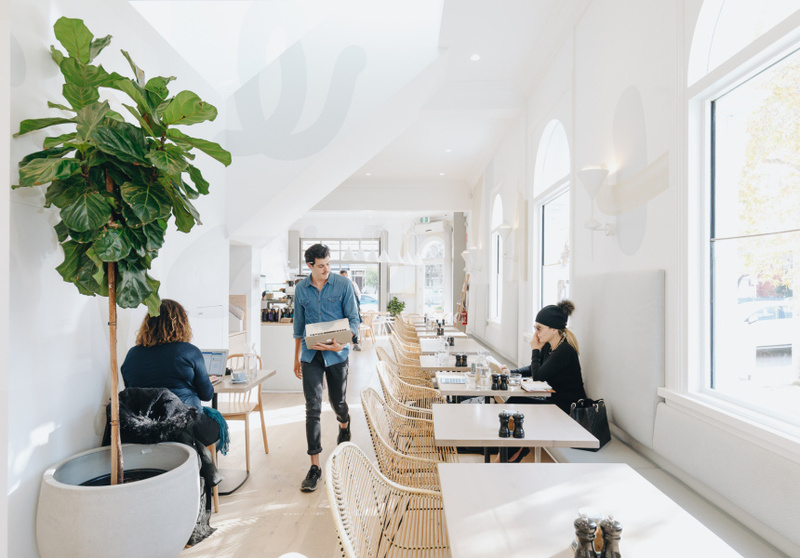 Coral accents and a handmade wooden communal table also add to the waterside vibe, but it’s considered and polished, with contemporary light pendants by Australian maker LAAL. “It’s got that calming effect when you walk in,” says Higgins, comparing the space to Moby, which has more of a “hustle and bustle” atmosphere. Lenny can seat 90, including outdoor seating on both Victoria Avenue and Page Street. The resort-style umbrellas shade the wide sidewalks and “provide this real pop of colour,” Higgins says. 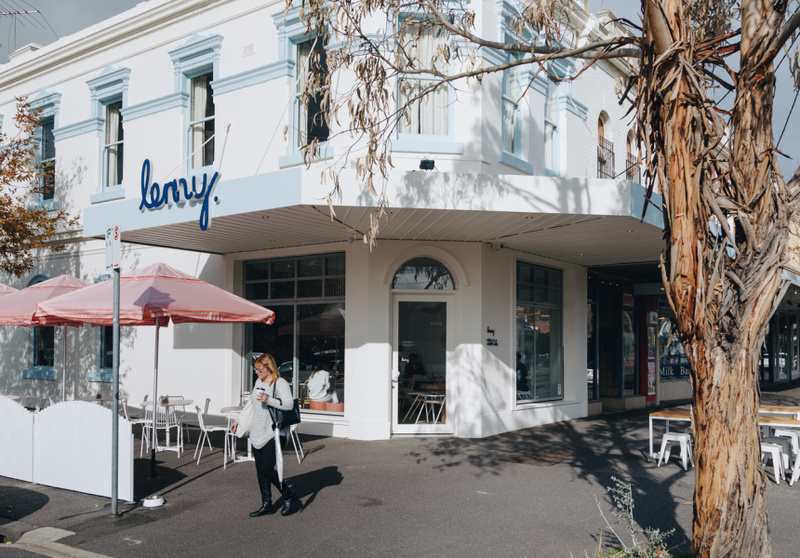 The co-founders weren’t actively looking to open a new venue, but Albert Park was a place they’d been keeping an eye on for its proximity to the beach and neighbouring suburbs Middle Park and St Kilda. When the heritage corner shop became available in February (previously occupied by The Petty Officer), they jumped. 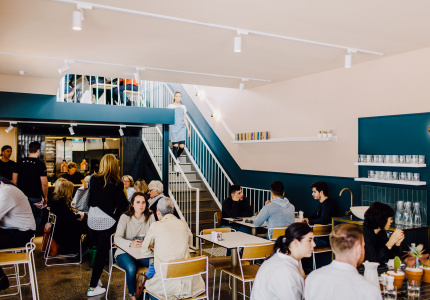 Here the food line-up is more lunch-focused than at its Armadale sibling. There’s a 16-hour braised-beef-cheek rendang curry, and a pumpkin hummus bowl with lamb kofta. The confit salmon and soba noodles is a stand out for Higgins. Those familiar with Moby will recognise the superfood salad and chicken bao too. Similarly, the Mr Lenny smoothie (aka Mr Moby) has been carried over because of its popularity. The liquor license is on its way. This article first appeared on Broadsheet on June 22, 2018. Menu items may have changed since publication.